At St. Joseph Catholic School in Oakville, the annual Lenten initiative was held to raise money to support the organization Sleeping Children Around the World, which purchases bed kits for children in underdeveloped countries. With each donation of $35, one child gets a foam mattress, pillow, sheet, blanket, mosquito net, school clothing, towel, backpack, and school supplies. Each year, the students at St. Joseph’s have the chance to collect donations towards purchasing bed kits on behalf of their class or family. 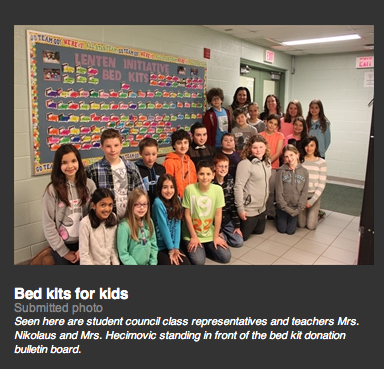 This year, the staff and students raised enough money to purchase 140 bed kits.